Merges all messages appearing at either of its 2 MIDI inputs to its MIDI output. $69.95 Seen a lower price? 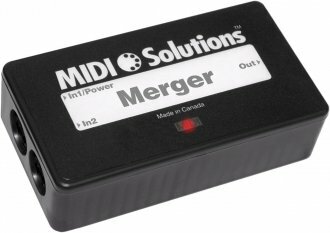 An easy-to-use product that requires no programming, the MIDI Solutions Merger merges all messages appearing at either of its 2 MIDI inputs to its MIDI output. 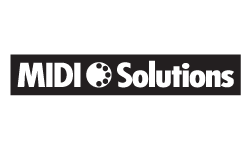 The MIDI Solutions Merger is a 2-in 1-out MIDI Merger. All MIDI messages appearing at the two inputs are merged to the output (including System Exclusive and MIDI Time Code messages). A fast merging algorithm ensures that the MIDI data is processed with minimal delay.